Would Labour be mad to promise an EU referendum? 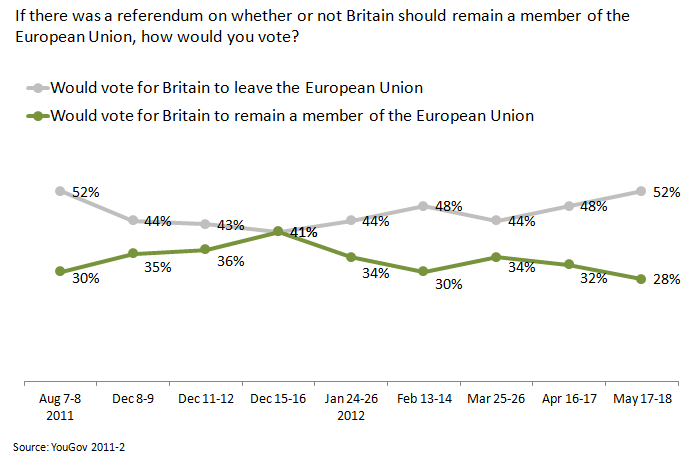 Number five on my list of trends to watch this year was Britain’s attitudes to the EU. In 2011, opinion had swung towards Britain’s staying a member and I guessed the trend would continue as an EU vote became increasingly plausible. 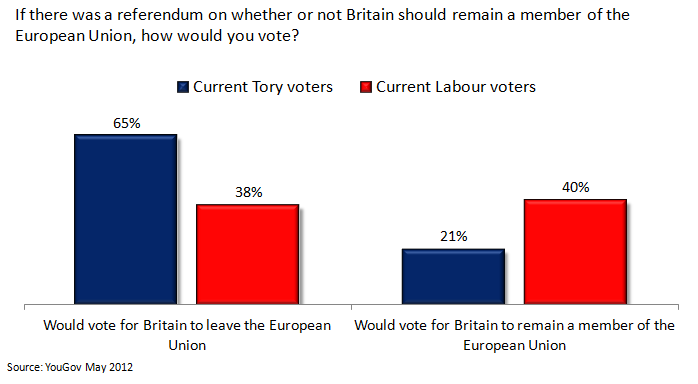 This shift raises questions about Labour’s recent hints that it’s considering pledging an EU referendum. The general view seems to be that Labour is bluffing to create problems for the Tories. The logic is that talk of an EU referendum hurts the Tories much more than it does Labour. But though the issue may hurt the Tories more than Labour, the assumption remains that Labour’s suggestion can’t really be serious. A referendum campaign would be a huge distraction for a Labour government. Only a small proportion of the public consider Europe to be one of the top issues facing the country (6% at last count), so not to have a referendum wouldn’t cost a Labour government much. Further, a no vote in a referendum would define how the government would be remembered by history. Assuming that the leadership wouldn’t actually want to withdraw, why take such a risk, with relatively little to gain? But let’s consider why Labour might commit to a referendum. This article was originally published on LabourList. This version includes charts not shown in the original. Given that Labour’s poll lead is now at its largest since 2003, and Cameron is more unpopular than Brown was at the last election, some might think that this humility is phoney or unnecessary. After all, if there were to be an election now, Labour would be elected with a landslide. But if we look beyond the headline figures, there are good reasons for Miliband still to be humble. Despite the unexpectedly good election results for Labour, public opinion still suggests much more unhappiness with the Tories than enthusiasm for Labour. 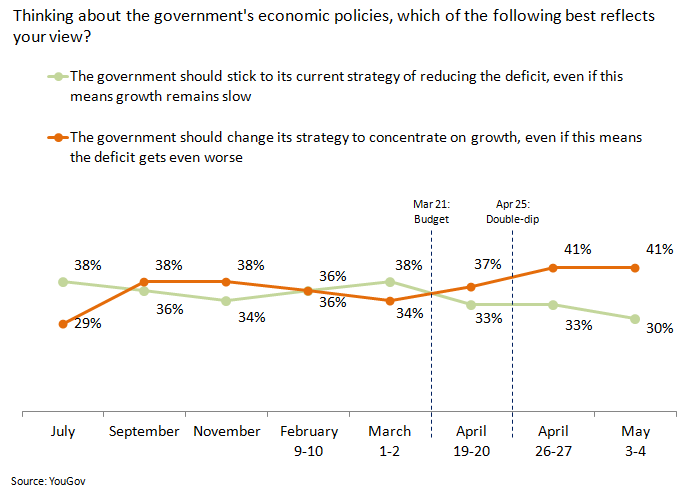 The crucial polling question, which is understandably receiving more attention than almost any other, is on which party is seen as best on the economy. According to YouGov, Labour have just moved ahead of the Tories on this, for the first time since the election. But this frequently-noted point is dangerously misleading for Labour supporters. The reason Labour are now ahead on the economy is because the Tories have lost trust, not because Labour have gained it. 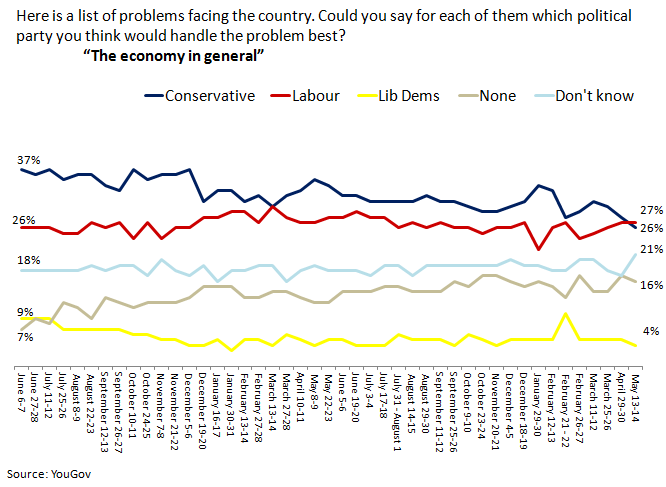 Indeed, Labour has gained no ground on being most trusted on the economy, according to this measure. Over the last year, Labour’s score has remained static, despite the fall in support for the Tories. This is reinforced by another poll question.